« It’s Halloween, Pass My Medication. Why I Shouldn’t Use The Computer At Night. OK, so it looks like it’s turning into Squirrel Friday around here, you know, like Casual Fridays but with less blue jeans and more squirrel. That sentence really makes absolutely no sense, but it’s after midnight and I just got home from work. I also drank some coffee and I need to decorate 40 effing cake balls (more on that later if it works) and I’m trying to hammer out this post because OMG Y’ALL, I THINK NAPOLEON HAD BABIES. So here’s the 411. I have a large picture window in my kitchen and where our “eat-in breakfast area” is located. Or as I like to call it, the place I dump clean laundry and where you go when you need socks and pants. And all of your clothes in general. My squirrel feeders are directly outside the large window and I monitor it closely throughout the day since I can see them while loading the dishwasher or making lunch or dumping the contents of the dryer all over the kitchen table. You can pretty much spot a squirrel any given hour of the day around these parts. Now normal brown squirrels are cute and all, but Napoleon is my number one ninja. I have yet to see Napoleon eat out of the feeder with my own eyes, but I know he totally does. I’ve seen him creep up on it, but as soon as he sees gross brown squirrels, he jams. He’s pretty much all, “I simply cannot forage for delicious sustenance along side the common folk” because Napoleon is special and he knows it. And also maybe a tiny bit British. He’s probably smarter than I am because I bet you a bag of squirrel food Napoleon doesn’t require assistance from google to spell “sustenance”. I looked out my window earlier this week and I almost fell out because Napoleon was perched on my feeder. Eating! Next to a brown squirrel! I looked again and realized it was a little bitty version of Napoleon, like when your husband who isn’t allowed to touch your laundry dries your favorite tshirt from Gap in the dryer on HIGH and it comes out looking like it would be a half shirt on Webster. We have several options here. 1. Napoleon is a female and totally had babies. 2. Napoleon is a father. 3. Napoleon’s nieces and/or nephews are visiting. 4. 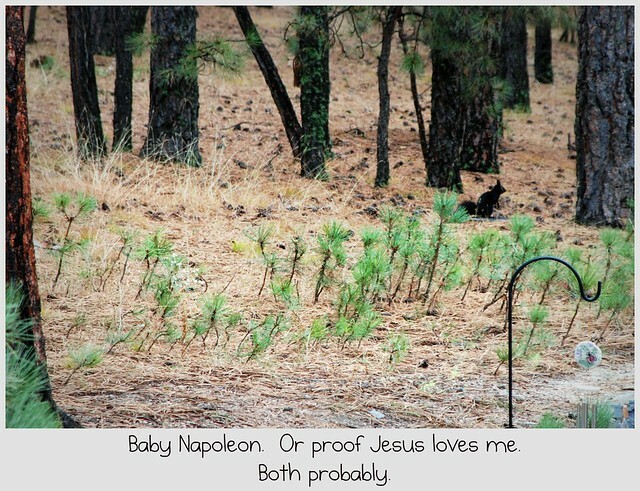 Napoleon has spread the word throughout the forest underground that ZDub’s Squirrel Sanctuary is totally money. Like a resort. Either way, it’s a gift for all of us to enjoy. P.S. Join me here on Monday, I’m going to have some wicked stuff to share. And pictures too. My Halloween costume was meant to grace your eyeballs. P.P.S Unless Napoleon learns to roller skate then all bets are off. of info in such an ideal means of writing? for a similar matter, your site came up, it seems good. website needs far more attention. I’ll probably be back again to read through more, thanks for the advice! you really understand what you are speaking about! Bookmarked. great educational piece of writing here at my house. Hey There. I discovered your blog the use of msn. That is a really smartly written article. of your helpful info. Thank you for the post. I’ll definitely comeback. message home a little bit, but instead of that, this is wonderful blog. I am sure this piece of writing has touched all the internet people, its really really good paragraph on building up new blog. topic however I just had to ask. Thanks!